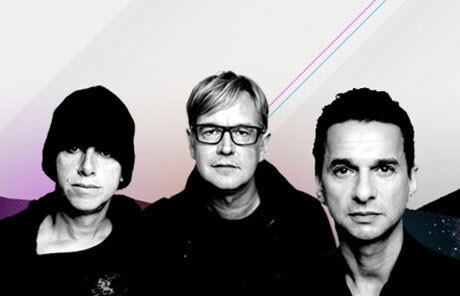 Aging synth pop survivors Depeche Mode have finally finished their upcoming new album Sounds of the Universe and dropped word of a firm release date. On April 21, the band have confirmed they will release the follow-up to 2005's Playing the Angel courtesy of EMI in North America and a day earlier in Europe via Mute. Depeche Mode recorded this album in Santa Barbara and New York, and apparently on a pile of vintage gear, relying old analog synths and drum machines to conjure up the retro-futurist jams featured on the record, the press release says. UK producer Ben Hillier (Blur, Doves, Elbow, as well as Playing the Angel) was behind the boards on Sounds of the Universe, and the first album single will be "Wrong." In an interview with Billboard, keyboardist Andy Fletcher said: "We think this album has got quality. And we recorded a lot of extra tracks which will be on a deluxe version." He added of the band's current status: "In some ways, what's bizarre is that we're actually playing to more people now than even at the height of our chart success with Violator . I think it's down to different generations listening to Depeche Mode. We've been going for nearly 30 years, and it has just grown and grown and grown." A confirmed tracklisting for Sounds of the Universe has yet to be announced.